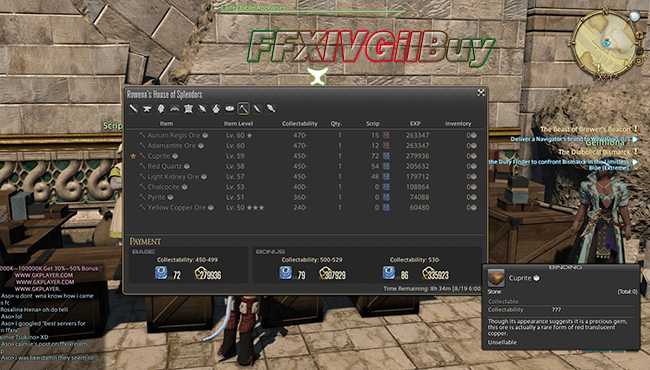 In FFXIV, ‘Collectables’ are gathered unspoiled items which can’t be sold on the marketboard nor used in crafting. The main purpose of Collectables are to be turned in for Red Gather’s Scrips and Blue Gatherer’s Scrips, which can be used to buy all kinds of gatherer-specific items, such as Favours, Tomes of Regional Folklore and gear. Each Collectable item has a stats called Collectability. The higher the collectability it is, the more scrips it can be exchanged for. This means the same items may have different Collectability due to this nature. Collectable items can’t be stacked and each will use 1 inventory space. You can only gain exp from turn-ins before level 56. After level 56, you can start to earn Blue Scrips. And after level 60, you can earn Red Scrips. How to gather an item to make it a useful Collectable item? After engaging an Unspoiled Node, activate ‘Collector’s Glove’. You can activate or deactivate it any time at will. Firstly, you need to reach the Unspoiled item. You can either use Toil of the Mountaineer or hit the slot directly to do so. You can buy cheap FFXIV Gil from FFXIVGilBuy to get your desired items. If you visit a node for the first time, feel free to use Toil. The items will show up as hidden with 25% success rate. If you want to use Sharp Vision III to increase that by 50%, resulting in 75%. Gather all those different items for the first time so you don’t need to use Sharp Vision III again next time. If you don’t visit a node for the first time, you should use 1 attempt to hit the slot directly to reach the item instead of Toil which can ruin your chances to get any useful Collectables. If you can’t reach the item with 1 item, or if the item is at random slots, you will don’t know where it is and the Toil become a valid thing to use. Click on the item while ‘Collector’s Glove’ is active when the item is reached.then the Collectable Gathering Panel will be opened up. Then it is to use multiple skills to increase the Rarity of the item and collect the items before you run out of attempts. And the higher the rarity the items are, the more scrips it will give you when handed to the Collectables Appraiser NPCs. The skills that can increase Rarity of an item are called Appraisals. Each item has a Wear of 0/30. If you failed to complete the item before durab hits zero in crafting, you will botch. If your item’s wear is over 30/30 in gathering, the chance of collecting will drop to 10%. Except for increasing Rarity and Wear, each Appraisal skill can use up 1 attempt, which means the more Appraisals you use, the fewer items you can collect at the end. If you have burnt through all your GP to increase Rarity and used up most of the Wear, you should leave at least 1 or more attempts to collect item. Then you can send those items to Collectables Appraiser NPCs at Idyllshir or Mor Dhona to exchange for scrips. Your Collectable item must reach certain amount of Rarity before the NPC can pay your scrips. But the more you push Rarity, the more Wear you will generate and the fewer attempts you have left to collect the item. Items with higher Collectability will give a little more scrips,but it is no better than 2 to 3 items with lower but acceptable Collectability. Therefore, 2 items of lower but acceptable is to reach a nice amount of acceptable Rarity. When maximizing the attempts remain, you can collect the items as many as you can during a run.